This Corralejo Map shows popular popular attractions, places of interest & transport locations. Click the name in the right column to highlight the location on the map. Corralejo is Fuerteventura busiest and largest tourist resort, which is constantly growing in size, but still retaining many of it's original charms as a fishing village. 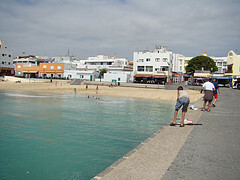 The old town is located next to the harbour, and has a church and town square, now the centre of Corralejo's nightlife. The overall atmosphere is relaxed and running at a calming pace. The 7 mile long Playa Grande beach and sand dunes that lie to the south of the town. A bustling harbour from which you can enjoy watching all the boating activity, or take one of the many boating trips from glass bottom boats, ferries to other islands, fishing trips, sailing trips or scuba diving trips, many of which you can book online. 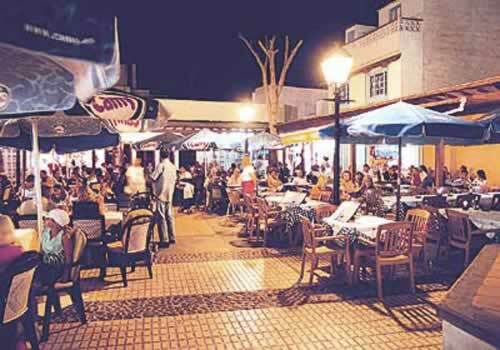 A pleasant sea front promenade with bars, restaurants and shops. The almost guarenteed sunshine in summer and winter. 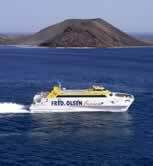 There are 5 ways to travel to Corralejo from the airport. There is not a direct bus from Corralejo to the airport, you have to change at the Puerto del Rosario, the island capital. Corralejo Playa Grande beach is a beautiful 7 kilometres of fine & very light coloured golden sandy beach and sand dunes which have been the movie backdrop to several fashion and TV advertisements. The beach is located just south of Corralejo and in places is hundreds of metres wide. You can select a busier section of the beach with sun beds and umbrellas on if you want you should be able to find a stretch of beach all to yourself. Along side the road there are several hard shouldered sections for cars to park, in other areas make sure you do not get bogged down in the soft sand alongside the road. The sun beds and umbrella sections and popular car parking areas on the main FV1 road can easily be seen on our Google maps if you zoom in, remerber you can easily drag the maps in any direction or if you prefer use the move arrows on the left side of the map. The best section of Corralejo Playa Grande beach is dominated by the 2 massive RIU hotels, the only hotels on this magnificent beach. A gay section is located about 2 kilometers south of the 2 RIU hotels. This section is at the 22 kilometre marker "milestone" from Puerto Del Rosario. The Corralejo town beach is a small white sandy beach right in the centre of town, there are plenty of bars and restaurants, backing this beach. This beach is sheltered and along with the nearness of toilets is ideal for families. Because the beach is in town it is NOT suitable for naturists looking for an all over tan. Additional , tours, excursions, trips and activities are available from other resorts. There is no shortage of banks and hole in the wall cash machines. There are 2 childrens playgrounds in Corralejo, very popular, especially with locals in the early evening. For full details of the following bus routes click the bus route link below. Our bus route information includes timetables and main intermeditory stops. Onward connects can be made from Puerto del Rosario bus station including buses to the airport. Go on a Monday or Friday if you want to combine it with a visit to the twice weekly market held next door. The Corralejo Tourist Information Office is located at the harbour and near the music square.